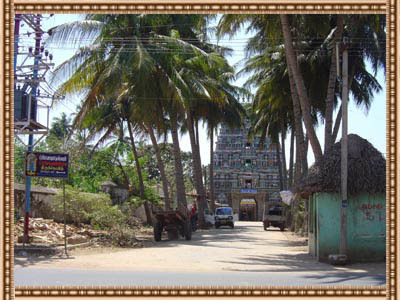 History : Thirumangalakudi is known as Panchamangala Kshetra.This temple is 1000-2000 years old. Lord Shiva in the temple is a swayambumurthi (self formed). The Linga part is taller than the Avudayar part in this temple. Devotees those who perform pooja in Sooriyanar Temple, dedicated to Lord Surya, the ' Sun god ' for relief from planetary adversities, should visit 'Prana Natheswarar' temple first, and then only proceed for the Navagraha sun temple temple. Brama crused planets (Navagrahas) to have Leprosy for relieving a saint from leprosy disease. As per the request of navagraha to releive from the sins, Brahma asked them to go to thirumangalakkudi and pray 'Kol Vinai Theertha Vinayagar' (Ganesh who absolved sins of planets) to be absolved from their sins. Navagrahas performed penance on the Swayambu Linga Shiva and offered 'Curd Rice Nivedhana ' without salt on a ' Vellerukku leaf ' to Lord and got releived from the leprosy disease. 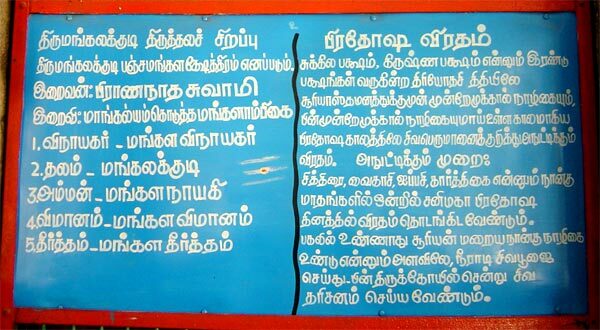 It is in Thirumangalakudi temple that even the Planets got relieved of their curses. 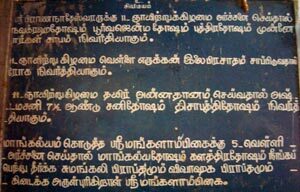 A minister of King Kulothunga Chola built this temple without the sanction of the king using the revenues of the state. The minister was punished and his corpse was brought to Tirumangalakudi. The minister's wife worshipped ' Mangalambigai ' (Parvathi) of this temple to save her ' Mangalyam ' and get back his husband, from then on the place is believed to provide aegis to Mangalyam. Mother Mangalambika blesses the devotees from Her own shrine. Women are blessed with ' full marital prosperity ' (Deerga Sumangali Bagyam), getting the Mangal Sutra from the blessingful hands of Mother Goddess are the glories of the temple. The Mangal Sutra thread in the hand of Ambica is offered as Prasad to women awaiting marriage promising a good match. Women take these threads from Ambica, wear them.This ensures all auspicious married life to women till the end. While entering Lord Shiva shrine, Mothers Mahalakshmi and Saraswati (without Veena in hands) are on both sides of the shrine as Dwarapalakis. Still noteworthy is that they are sitting in Padmasana style. There are two Natarajas in the Prakara with Mother Sivakami. There is a Boodha Gana playing a musical instrument under the feet of the Nataraja near the main Nataraja.Lords Vishnu, Brahmma, Mothers Kali,Ambica, Akashavani, Bhooma Devi, Sage Agasthya and Sun God had worshipped in this temple.There is a Maragatha (emerald ) Linga in Nataraja shrine. Daily midday abishek is offered to this Linga with milk, rosewater, honey and sandal poured through a conch (Valampuri Sangu). Consuming this abishek Prasad is believed to be an effective treatment for diseases. There is also an idol in the temple called Purusha Miruga (an animal) with human, animal and bird faces. Poojas : C urd rice nivedhana without salt is offered during the midday puja in the temple. Also those failing in the annual ritual for their forefathers offer this nivedhana to Lord. Devotees hold curd rice on Vellerukku leaves between 12-12.30 midday time, offer it as nivedhana to Lord and take part in the pujas in the prakara continuously for 11 Sundays for relief from planetary problems and remedy from all diseases. Worship of Mother Mangalambica for five consecutive Mondays ensure safety to the Mangal Sutra blessing, relief from the adverse aspects of the serpent planets Rahu and Ketu and of Sani Bhagwan. The worship also removes delays in marriage affairs in families. 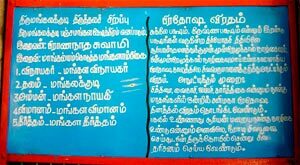 Temple timing : The temple is open from 6.30 a.m. to 12.30 p.m. and from 4.00 p.m. to 8.30 p.m.
Travel Information : This temple is located in the Kumbakonam-Mayavaram route. 13 km from kumbakonam via Adudurai -Thirupanandal road. Phone : +91-435 - 247 0480.